I had seen the trailer for A Dangerous Method months ago and was highly anticipating its release. My excitement increased learning I'd get to see it early as part of the Philadelphia Film Festival. But just like when you're in a restaurant and there's an item on the menu that sounds perfect, you envision how it will come presented, the moment of satisfaction when it hits the pleasure center of the brain... but upon arrival to your table, it's dry or watery or small or tasteless or just not what you had in mind. And such was the case with David Cronenberg's A Dangerous Method. In my opinion, the film is lifeless, it's just lays there on one level. You keep waiting for the hit to your brain that never comes. Yet the elements were all there, two of my favorite, stellar actors (Viggo Mortensen and Michael Fassbender) playing two fascinating figures from history - Dr. Sigmund Freud and Dr. Carl Jung, presenting us with the origins of Psychoanalysis, duking it out (via the postal service) when their beliefs and methods took on differing approaches. 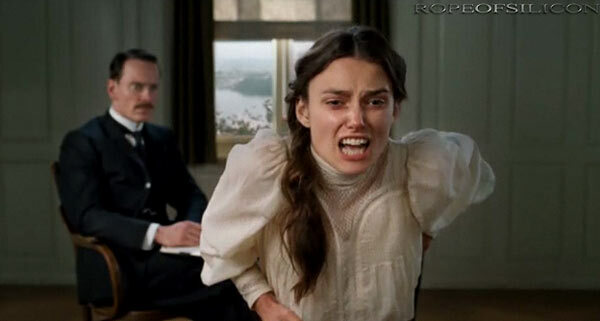 And best of all, Jung's torrid love affair with an insane patient, Sabina Spielrein (Keira Knightley). And the acting is good. I'm now convinced Michael Fassbender, is one of those shape-shifting actors that has no real form of his own, he just morphs into any character he's playing. Viggo Mortensen has aged with season and feels comfortable in the role of father figure. And I knew Keira Knightley would put that under-bite, flashing eyes and lithe figure to good use, playing someone who's mental faculties weren't all there. One thing I found interesting, which didn't really come to light in the movie, but I read about in reference to the background material - many women of the late 19th and early 20th Century suffered from a mental illness called Hysteria. I've heard of this, but never really knew what it meant, or rather the cause. It seemed women had so much pent up frustration over not using all their capabilities, that it would result in a fit of hysterics. Funny, I feel it's the opposite now, women have to be such multi-taskers, expected to do so much everyday, that the stress of it all is sending many over the bend. Perhaps the problem with A Dangerous Method is that the script got watered down through too many adaptations; as the screenplay was adapted by Christopher Hampton's (Atonement) 2002 stage play The Talking Cure, which itself is based on the 1993 non-fiction book by John Kerr, A Most Dangerous Method. 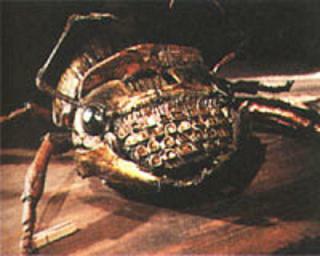 I do like that The Philly Film Fest is pairing many directors current work with a film from their past, however, I also didn't care for Cronenberg's Naked Lunch - monster typewriters, bugs a plenty, homophobic themes, writer's anguish, all in an incomprehensible soup of yuck!